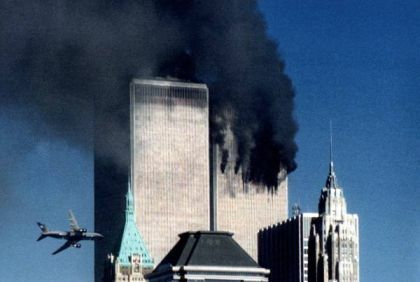 American Airlines Flight 11, and United Flight 175 hit the two towers at the WTC. 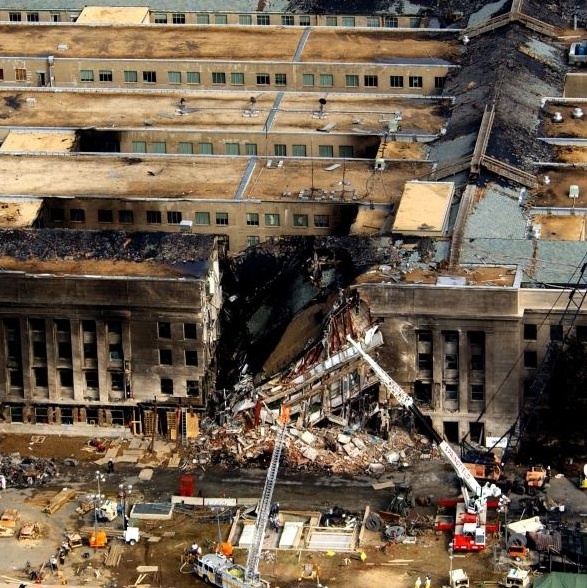 American Flight 77 hit the Pentagon. And United Flight 93 (destined for Washington, DC) crashed in Shanksville, PA after fighting between the hijackers and the passengers. We used to hear the term “defining moment” thrown around a lot, about the attack, but not so much anymore… I actually heard a millennial last week asking what the big deal was with 9-11. It’s obvious the education system is downplaying the whole thing, and I walked off before I said what I thought of his lack of education. Others started to wonder in to see why I was ‘violating’ University policy, and the pilot called me back, about that time. I do remember something to the effect of “a terrible accident has occured” being said on TV about the time the pilot saying this wasn’t an accident, it was an airliner and something bad was going down. About a half an hour later, I was called into a meeting with law enforcement about securing/protecting facilities and infrastructure; we were interrupted by the announcement that the Pentagon had been hit, and the tone of the meeting changed from what if, to we need to prepare NOW! I also remember driving back to my office and hearing about Shanksville and UA 93 during that time. We set our emergency response plan into effect, sending folks home and going into a 24 hour response cycle. Old Ironsides will fire rounds and play taps based on the timeline of the attacks today. Link HERE. We weren’t attacked by a country with borders. We were attacked by a group promoting a religion the Western world finds as barbaric. That’s why the strong push by some to embrace this religion galls me. They may proclaim peace all they want, but the root of their faith is to murder unbelievers and turn the world into a Medieval cesspool. That millennial’s attitude is infuriating! He should be tied to a chair and forced to watch hours and hours of news coverage – our country was attacked – it was a very BIG deal. It’s not a lack of education – he has the internet at his fingertips, it’s laziness and ignorance. There is a documentary, only shown one year, called “The Falling Man.” Make him watch just that one. He’ll be throwing up still this time next year. It’s not laziness and ignorance. It’s by design. How many students were taught about the Olympic attack in 72? Or the Beirut barracks? Or the Cole? Or the reason behind all of the ‘mentally unhinged’ attackers who all have one thing suspiciously in common? The first attack upon the Twin Towers? Or the first actual actions taken by the new US Navy, where the USS Constitution won her spurs, and lost her sister-ship the Philadelphia? How many US ‘citizens’ know about the Fall of Acre, or the truths of the Crusades, or the Reconquista, or the Battle of Lepanto, or the Gates of Vienna (where the Winged Hussars of Poland saved Europe, and possibly the world,) or why Vlad Tepes is a national hero in his own land, or, or, or, or, or…? Who sold most of the slaves to white slavers? Who still to this day enslaves both blacks and whites? You are right, it isn’t a lack of education, it is the result of education that he/she/it and so many of his/her/its fellow useful idiots are so.. un-educated and idiotic. By design. Which pisses me off even more. My attitude that day – and since – is much the same as yours. Your words are true, and well written. Mrs Crankipants, I respectfully disagree. The millennial should not be forced to watch news clips…He should be forced to serve four years in one of the Armed Forces branches, and his friends too! Should read pig fat not live fat…dang fat fingers! Retired Cop – I agree, but I doubt these man-bun, soy milk latte drinking, man children could handle boot camp, never mind combat. But it’s a nice thought. I’m not so sure about that Mrs. Crankipants. The US Military has a lot of experience making all fit one size, and I tend to think that if a few of those nasty old D.I. types could be brought out of retirement, they’d get the man-bun, soy milk latte drinking, man children into shape. What’s a man-bun? I’ve never heard that one. It’s what Toshiro Mifune wore in his movies. While it may suit a samurai, it does make a millennial look even more like a sissy. 1. It looks fine if you are Toshiro Mifune. 2. You are not Toshiro Mifune. What Mifune wore was special. It was part of the samurai’s rank and privilages. Specifically targeted when Imperial Japan modernized. It is a badge of honor, of a code, a way of life, completely opposite of man-bun-hood. Man-buns, on the other hand, are the sign of an unwashed and idiotic intellect, just this side of dreadlocks for being an outward expression of the wearer’s lack of a pre-frontal cortex. I think that we all remember where we were and what we saw on TV (or live) that day. It seared into my memory and needs to be replayed over and over every time the progs demand open borders. I didn’t see any of it. I heard it. I only had a radio, no TV, and I couldn’t tie up the phone line with my computer, because I was a medi-vac pilot and we were getting messages from our home office about when we might be back in the air and what we’d need to do for the FAA and military. It was a beautiful, crisp September Tuesday. I’ll never forget. I watched the whole thing on TV and when the first building went down, my first thought was, “Holy (crap), there are firemen in there.” I was sick at my stomach after that. I’ll never forget. Larry Getzfred’s and my tour at VP-6 overlapped by a month so I didn’t get to know him but he WILL be remembered, along with ALL who have sacrificed everything since 9-11. I was in Washington State, the clock radio woke me to get ready for work. The disembodied voice said that a plane had hit the WTC. No indication that it was an airliner, just a plane. With no visuals, I assumed some idiot in a Cessna had got lost, tragic, but no big deal. I got showered, etc went to the living room and turned on the TV. OMG a second plane had hit the other tower, this was no accident, this was war! Dutifully went to work but didn’t get much work done, spent most of my time on the internet watching news feeds. About noon the Powers that Be decided that because we we working on a government project, we might be a target, and sent us home. I can’t say I was shocked, stunned a bit, but not shocked. Anyone aware of what was happening in the world at that time knew it was only a matter of time before the terrorists struck us on American soil. What was surprising was the scale. I was also incredibly pissed, but age, and infirmary precluded joining the military, so I decided that the best thing I could do was to continue to do my job, support the military, and pray that the perpetrators faced swift justice. If I may ask, did you serve with Capt. Punches? All- thanks for the comments! Obviously I’m not the only one that feels the same way. Mr. Vazquez, yes I served with Jack Punches in VP 30, and later worked with him in the fleet, and also when we were both working for the navy after we retired. I was full of anger until I read about the USS Constitution marking the event. That teared me up. She who has seen war with the Islamic hordes since her beginning, still here, still seeing the Islamic hordes. Yet people think this is a new thing? I am sorry that your friends and compatriots were lost. Along with so many that day. But you and others keep them alive in your hearts. Gree with all comments and , “Hand Salute ” to all! I was working nights when 911 happened. Couldn’t sleep, got up,turned on the tv and saw coverage of the first plane. Saw the second one hit live and knew it must be an attack. I remember seeing video of a NYFD engine stopping several blocks away and 5-6 firemen dismounting and start walking in, carrying tools and air packs. Both Towers were still up but burning heavily. I remember thinking they were probably heading to their deaths and knew it but kept going because people needed help. I started crying right there in my kitchen…hell, I’m crying now thinking about it! I have a good friend who is a retired Navy Chief, he called me to see if I knew. I answered the phone sniffling and he promptly said, yeah he knew but that’s what fireman do! That without me saying anything. What bravery was displayed that day! If we decide to turn the entire range of Muslim countries into parking lots, we would only be following their own doctrine. And I would vote for whoever put that into play. Guess I’ll shut up now before I get banned! I am still angry about that day, I used to have good feelings of muslims until that day. I know there are good ones but it seems that there is a concentrated effort to kill me and mine. I saw us come together as a country for a while, until the far left started ripping us apart because they hated “W”, and I am still angry And 7 years later, we as a society after being guilted elected the petulant boy king and he went out of his way to weaken us and degrade us on the world stage. I am still angry about what I have seen my country that used to be the beacon of freedom and home turn into what we have today. I am still angry and I have started to hate, I keep looking for forgiveness in my soul but I am getting angry. I see the constant attacks on the institutions that made this country great and we as a people are starting to lose our way and no longer believe in the greatness of America and I start to get angry. thank you for never forgetting and God bless you! Better late than ever, but I’ve gone with “Islam delenda est” since I heard the original. Cato called it.